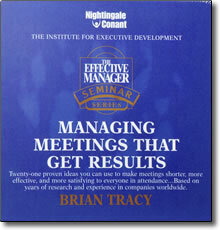 Managing Meetings that Get Results DVD by Brian Tracy – Discount! 21 proven ideas you can use to make meetings shorter, more effective, and more satisfying to everyone in attendance … Based on Years of research and experience in companies worldwide. It has been said that the average manager spends almost 40% of their time in meetings. Therefore, it’s imperative that you make meetings as productive as possible. Meetings can be the most productive or destructive use of you and your companies time. Managing meetings can effectively improve effectiveness by more than 50%. Your company may not have all the money in the world, but you can still have the best training in the world. With the rate of business failures today, it’s important to start out with an effective business strategy. Brian Tracy will teach you all of the various components of an effective business strategy. Learn the same strategies that all successful business are built on.